It might seem counterintuitive, but the dreaded “polar vortex” is bringing its icy grip to the Midwest thanks to a sudden blast of warm air in the Arctic. So the AP strongly hints that something that has happened twice in this decade is the fault of magical climate change, which causes hot, cold, dry and wet weather. One of the things I do in my day(s-ending-in-Y) job is to list the record high and low temperatures each week. Since I have been doing that the past seven years, we have had 10 days of record or record-tying highs, and nine nights of record or record-tying lows. Is that really a trend? We haven’t had a really bad winter since that 2013–14 winter, which, by the way, set zero cold-temperature records in Presteblog World Headquarters. Did the polar vortex cause the –51 temperature in Lone Rock Jan. 30, 1951? That was the coldest temperature in the nation that day, leading to the U.S. 14 sign “Coldest in the Nation with the Warmest Heart,” accompanied by a polar bear. How about the –55 in Couderay Feb. 2 and 4, 1996? That was seven months after record highs throughout Wisconsin, including one dog’s-breath day where Appleton had the nation’s highest heat index, 140. How about the days in January 1936 when record lows were set, six months before record highs (including the state’s all-time record high, 114 in Wisconsin Dells July 13, 1936)? … indicate a trend toward colder weather, but not a hugely strong trend. This is an example of agenda journalism — deciding what the story is about and finding evidence for your position, instead of finding out whether this is really unprecedented weather. (Check the winters of 1977 through 1979, which were horrible and far worse than anything this year.) And the national media wonders why it’s lost credibility with its readers, listeners and viewers. You may want to swap out your snow boots for rain boots this year. Most of the country can expect more rain and less snow this winter, says The Old Farmer’s Almanac. The OFA, founded in 1792, just released its annual weather forecast—and it says that 2019 will be warm and wet. “This winter, we expect to see above-normal temperatures almost everywhere in the United States, except in the Southwest, where we’re predicting a colder-than-normal season,” the OFA forecasts. “Our milder-than-normal forecast is due to a decrease in solar activity and the expected arrival of a weak El Niño, which will prevent cold air masses from lingering in the North,” it continues. So much for dreaming of a white Christmas. According to the report, precipitation will also fall in the above-normal range (except in Southern California, the Southeast, and a small patch of the Midwest), while snow levels will be below-normal (except the “interior West” and again, part of the Midwest). Don’t toss those snow boots just yet: Just days after The Old Farmer’s Almanacforecasted a warm, wet winter, the other Farmers’ Almanac has predicted the exact opposite: A long, cold, snowy winter. In particular, the Northeast, Great Lakes, Ohio Valley, Midwest, and even Southeast can expect “teeth-chattering” temperatures due to a cold front in mid-February, according to the Almanac. Those bummed about the OFA’s forecast of more rain and less snow this season will be happy to hear that they may get a white Christmas after all: The Almanac predicts plenty of snowfall in the Great Lakes states, Midwest, and central and northern New England (they even offer month-to-month predictions). Above-normal precipitation is also expected in the Pacific Northwest, Northeast, and Mid-Atlantic States, whether in the form of ice, rain, or freezing rain. Even the Southwest and Southeast will reportedly be wet in December 2018 and early 2019, respectively. It’s worth noting that the National Weather Service‘s predictions were similar to the OFA’s: above-normal temps for most of the country, particularly the Southwest, Northeast, and Northwestern Alaska. Of course, as The Washington Post notes, you should take all this with a grain of salt, as weather forecasting is simply not yet advanced enough to ensure accurate predictions this far out. Still, it never hurts to be prepared for any kind of weather. Time to shop for snow boots—or better yet, boots that double as rain and snow boots! Perhaps the best indication that Irma failed to live up to its billing is the fact that the broad stock indexes — including insurance companies — rallied on Monday while various construction-related stocks took it on the chin. When can we expect to see stories about how global warming deserves the credit? There’s no question that Irma was and continues to be destructive. But there’s also no question that it was not nearly the storm it was predicted by all the experts to be. Last week, there was talk of massive destruction across the state, with damage estimates ranging up to $200 billion. Miami Beach Mayor Philip Levin called it “a nuclear hurricane.” Storm tracks last week showed Irma remaining a Category 4 hurricane for a significant portion of its trek across Florida. When Irma shifted to the west as it approached, it was described as the “worst-case scenario” for the state. However, when Irma made landfall in the U.S., it’s strength quickly diminished and the actual damages to Florida in dollar terms will likely be 75% lower than predicted. While those dire forecasts were being made, environmentalists and politicians were busy pinning the blame on global warming. It was the same after Hurricane Harvey caused massive flooding in Houston. It’s the case whenever there is an adverse weather event. If there’s a drought, it’s because of “climate change.” If there’s flooding, climate change. Wild fires, climate change. Blizzards? Climate change. So will environmentalists credit climate change for Irma’s unexpected turn for the better? Even if that were true — and, for the record, we aren’t saying it is — environmentalists wouldn’t admit it, because the only thing that never, ever gets linked to climate change is good weather. Indeed, any talk of the benefits of climate change is treated as dangerous nonsense, not because the benefits are unlikely, but because that sort of happy talk might cause people to become “complacent” about the need to fight climate change through onerous, intrusive and massively expensive government edicts. That’s why you rarely hear about longer growing seasons that a warmer planet would produce in northern regions, which would lower food prices and reduce hunger, or the reduced number of fatalities from extreme cold, or how past periods of non-human-caused warming were ones of relative abundance. It’s also why there’s so little research into other potential benefits of climate change, or what the relative balance between costs and benefits would be. Who is going to fund research into such things when the entire government-science-research complex is singularly devoted to proving that climate change will destroy humanity? This one-sidedness isn’t evidence that global warming is real or inherently cataclysmic. It is, instead, evidence that global warming advocates are more interested in pushing a political agenda than actual science. Occasionally, however, some good news slips through the climate change praetorian guard. One was in the form of a study published by the prestigious peer-reviewed journal Nature in April 2016. The authors found that the weather in America had actually become increasingly pleasant over the past 40 years because of climate change — winters have been less severe while summers didn’t get much hotter. This summer, University of York environmental professor Chris Thomas published a book, “Inheritors of the Earth”, in which he showed how global warming could be good for biodiversity, because species that need warmth would benefit while those that don’t would be largely unaffected. Needless to say, these findings were not greeted with adulation from environmentalists. Don’t expect Mann to apologize if he, not Smith, turns out to be wrong. The last two Wisconsin winters have been historically mild. This past summer was certainly not hot, and it was wet, as predicted. Mild winters mean lower heating bills, which means more money in your pocket. That’s a good thing, not a bad thing, except, I guess, for those who want to control our lives through government. Winters are a major reason to not live in Wisconsin. I am favor of anything that makes winter less hideous. 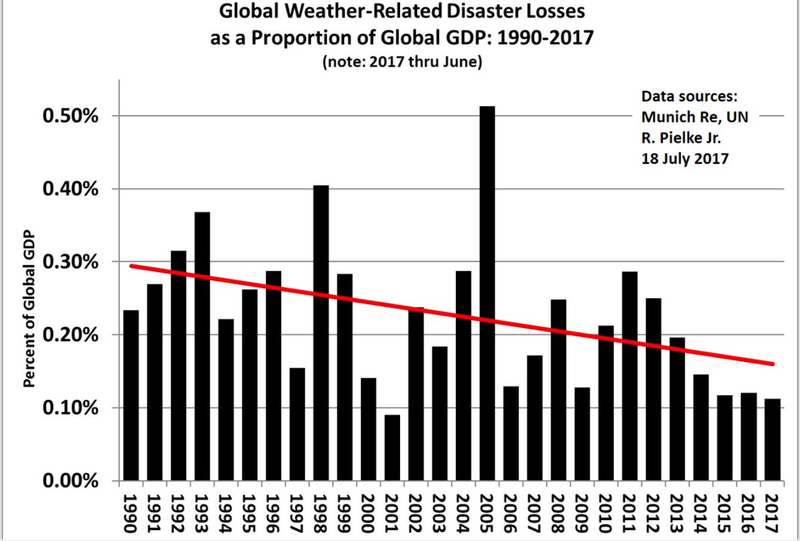 The arrivals of hurricanes Harvey and Irma led to predictable screaming about global climate change and the connection to hurricanes. “Feels more sinister”? — The arguments for catastrophic global warming have jumped the shark. Fact: Until August 25, 2017, when Harvey came ashore, the United States (including Hawaii) went a record 11 years and 10 months without a major hurricane. The period of record is from 1850 to the present. The former record was from 1900 to 1906, so we nearly doubled the previous record — very good news. In 1935, at least 408 people died when another cyclone slammed into the Florida Keys, many of them World War I veterans working on construction projects. And in 1957, Hurricane Audrey’s storm surges crashed into the coasts of Texas and Louisiana, killing 390 people. Hurricane Irma, which slammed into Florida over the weekend, was in a similar league as those storms in its sheer power, and the number of people living in vulnerable areas has only grown. So how has the number of deaths — in Florida, Georgia and South Carolina as of Monday night — remained in single digits? The answer is the modern science of hurricane monitoring and preparation, which has saved countless lives as forecasting, satellite monitoring and government planning have dramatically improved in recent decades. One study in the journal Epidemiologic Reviews calculated that America suffered an average of 1,400 hurricane deaths per decade from 1910 to 1939, 700 deaths per decade from 1940 to 1969, and about 250 deaths per decade from 1970 to 1999. “The number of people killed in hurricanes halves about every 25 years, in spite of the fact that coastal populations have been increasing, because of what we’re doing with forecasting,” said Hugh Willoughby, a professor of meteorology at Florida International University in Miami. Don’t just thank the meteorologists. Thank the modern, scientific, technological, and INDUSTRIAL civilization that made a science such as meteorology possible — and remember this the next time you hear a climate change alarmist want to take that civilization away. Human life was far shorter, more painful, and more uncertain in the pre-Industrial era. Return later today for a radical thought. The flood waters from Hurricane Harvey are mercifully receding from Houston. Unfortunately, the flood of hot takes blaming Houston’s development for the floods has continued unabated. Despite repeated debunking from a wide range of commentators and urban policy experts, the idea that unregulated development caused the massive swell of storm water has seamlessly shifted from off-the-cuff observations to conventional wisdom. “Houston’s sprawl gave the city terrible traffic and an outsized pollution footprint even before the hurricane. When the rains came, the vast paved-over area meant that rising waters had nowhere to go,” wrote Paul Krugman in his Monday New York Times column. Roane Carney of The Nation made the same claim last week, saying that Houston has witnessed a continual battle between developers who want to pave over green fields and the engineers and scientists who want to stop that in the name of flood prevention. For a more informed view, I spoke with Neil Sander, a principal at Dynamic Engineering Consultants, P.C. who holds a master’s in civil engineering from Johns Hopkins University. Sander has worked on commercial developments in the Houston area for the past five years. Far from being an unregulated wild west, Sander says, Houston is typical in how it regulates storm water runoff. “Houston is governed by a number of different storm water ordinances from different entities,” he tells Reason. “The City of Houston, Harris County Flood Control District, and the Texas Department of Transportation all limit the amount of water you can release from a development, regardless of how much you pave.” These regulations lay out rules for the quantity and rate of storm water runoff allowed from developments and for how that runoff is managed. One need only look at the City of Houston’s Infrastructure Design Manual for evidence of this. Nearly a quarter of the 400-page manual—which governs everything from traffic signals to easement requirements—is devoted to storm water collection and drainage requirements, dictating how much water must be detained for a given amount of pavement and how quickly that water must be drained from a property. Other rules cover everything from the design and capacity of drainage ditches and culverts to the minimum spacing of storm water inlets. Sander adds that the post-Harvey focus on impervious surfaces is misplaced. After a natural disaster of the hideous and shocking scope of the floods along the Texas coast this week, government response will never be—can never be—sufficient to people’s needs, either for immediate rescue or for long-term rebuilding. If you don’t believe a libertarian on that point, a friend of mine with zero ideological antagonism toward government experienced in volunteer disaster relief in post-Katrina New Orleans and elsewhere stresses to all his curious Facebook followers that government, local or federal, is just not actually equipped to deal with providing all the help people require when storms like this hit, the existence of agencies with names like “Federal Emergency Management Agency” (FEMA) notwithstanding. The New Yorker this week shines a light on one of the real solutions in the wake of disaster, one that thankfully doesn’t feel obligated to wait for government orders, funding, or control: the Cajun Navy, a private organization out of Louisiana skilled and experienced at boat rescues of people trapped in (or on top of) their homes in a flood. The Cajun Navy’s John Bridgers says modern private technology/communication companies like Facebook make the all-important communication of who is in need of help and where much easier, even as government’s 911 is strained beyond its capacities, as Houston Mayor Sylvester Turner admitted it was. Reason‘s Jesse Walker has reported and argued in the past, the issue isn’t just governmental vs. private: even big private bureaucracies such as the Red Cross fall prey to institutional imperatives and the impossibility of accurate and fast-moving local knowledge that make them often inefficient and ineffective. As Walker wrote in 2014 (though not discussing the Cajun Navy specifically) “such networks [are known] to be more flexible, more capable of adjusting to conditions on the ground, and—when the groups are themselves locally based—more receptive to local knowledge” in delivering needed aid quickly and smartly. The men and woman of the Cajun Navy live out the message of Walker’s reporting: the attitude that we must, or can, rely on public bureaucracies in moments of great crisis is insanely unsafe and wildly un-American. As we see so often, Americans inspired not by central commands and government contracts but by the will and desire to help, exist and rise to the occasion. The more than seven billion people living in the world today need affordable, abundant energy — and a livable climate — to flourish. But the world’s leading source of energy is also the leading source of increasing greenhouse gases. What to do? This is the vital question Al Gore took on in his 2006 film An Inconvenient Truth, and takes on again in his newly released follow-up An Inconvenient Sequel. As the most influential figure in the international climate conversation, Gore has a responsibility to give us the whole picture of fossil fuels’ impacts — both their benefits and the risks they pose to humans flourishing. Unfortunately, Gore has given us a deeply biased picture that completely ignores fossil fuels’ indispensable benefits and wildly exaggerates their impact on climate. The running theme throughout An Inconvenient Sequel is that Gore’s first film was even more right than he expected. The movie begins with defenders of fossil fuels mocking or ignoring the dramatic predictions of An Inconvenient Truth. Leaving aside a heroic (and highly disputed) portrayal of Gore rescuing the Paris climate accord, the rest of the movie focuses on vindicating Gore’s two chief predictions: 1) That we could replace fossil fuels with cheap solar- and wind-powered “renewables”; and 2) that continued use of fossil fuels would lead to catastrophic temperature rises, catastrophic sea-level rises, catastrophic flooding, catastrophic drought, catastrophic storms, and catastrophic disease proliferation. To justify these claims, Gore makes extensive uses of anecdotes: he shows us the town of Georgetown, Tex. and its use of 100-per-cent renewable energy, a deadly heat wave in India, a deadly flood in Miami, a deadly drought in Syria, a deadly storm in the Philippines, and the Zika virus penetrating the United States. Some of his anecdotes are meant to prove that cheap solar and wind are, as 2006 Gore prophesied, quickly dominating the world’s energy supply and, as 2006 Gore also warned us, that our rapidly warming climate is killing more and more people each year. But he has not given us the whole picture. Take the rising dominance of solar and wind, which is used to paint supporters of fossil fuels as troglodytes, fools, and shills for Big Oil. The combined share of world energy consumption from renewables is all of two per cent. And it’s an expensive, unreliable, and therefore difficult-to-scale two per cent. Because solar and wind are “unreliables,” they need to be backed up by reliable sources of power, usually fossil fuels, or sometimes non-carbon sources including nuclear and large-scale hydro power (all of which Gore and other environmentalists refuse to support). This is why every grid that incorporates significant solar and wind has more expensive electricity. Germans, on the hook for Chancellor Angela Merkel’s self-righteous anti-carbon commitments, are already paying three times the rates for electricity that Americans do. If we look at the overall trends instead of engaging in anecdotal manipulation we see that fossil fuel energy is the fastest-growing energy source in the world — still. Fossil fuels have never been more vital to human flourishing. There are 1,600 coal plants planned for the near future, which could increase international coal capacity 43 per cent. Advances in technology are making fossil fuels cleaner, safer, and more efficient than ever. To reduce their growth let alone to radically restrict their use — which is what Gore advocates — means forcing energy poverty on billions of people. Gore and others should be free to make the case that the danger of greenhouse gases is so serious as to warrant that scale of human misery. But they should have to quantify and justify the magnitude of climate danger. And that brings us to the truth about climate. The overall trend in climate danger is that it is at an all-time low. The Emergency Events Database (EM-DAT) shows 6,114 climate-related deaths in 2016. In other recent years the numbers have maxed out in the tens of thousands. Compare this to the 1930s when, adjusted for population, climate-related deaths hit the 10-million mark several times. The most significant cause of our radically reduced climate danger is industrial development, which takes a naturally dangerous climate and makes it unnaturally safe. And industrial development is driven by cheap, plentiful, reliable energy — which, today, overwhelmingly means fossil fuels. Climate will always be dangerous so priority number one is to have the energy and development to tame it. Modern irrigation, residential heating and air conditioning have made once uninhabitable places perfectly comfortable. Gore’s Inconvenient Sequel gives a biased, self-serving, and convenient picture of fossil fuels and climate — convenient for Gore’s legacy, that is, but inconvenient for the billions his energy poverty policies will harm. As citizens, we must start demanding responsible thought leaders who will give us the whole picture that life-and-death energy and climate decisions require. In February 2007, the day after his panicky global warming film “An Inconvenient Truth” won an Academy Award for best documentary, a shocking report based on public records revealed that Al Gore’s Nashville home consumed 20 times more electricity than the average American household. Facing scrutiny for his extreme electricity consumption, the former vice president pledged to renovate his home to become greener and more energy-efficient. The extensive and expensive overhaul of Gore’s house included installing solar panels and geothermal heating. The past year, Gore’s home energy use averaged 19,241 kilowatt hours (kWh) every month, compared to the U.S. household average of 901 kWh per month. Gore guzzles more electricity in one year than the average American family uses in 21 years. In September of 2016, Gore’s home consumed 30,993 kWh in just one month – as much energy as a typical American family burns in 34 months.• During the last 12 months, Gore devoured 66,159 kWh of electricity just heating his pool. That is enough energy to power six average U.S. households for a year. From August 2016 through July 2017, Gore spent almost $22,000 on electricity bills. Gore paid an estimated $60,000 to install 33 solar panels. Those solar panels produce an average of 1,092 kWh per month, only 5.7% of Gore’s typical monthly energy consumption. Al Gore resides in a 10,070-square-foot Colonial-style home in the posh Belle Meade section of Nashville, the eighth-wealthiest neighborhood in America according to the U.S. Census Bureau. This is nothing new for environmentalists, who fly to Switzerland every year to proclaim that global climate change is destroying Gaia, which they worship instead of God. 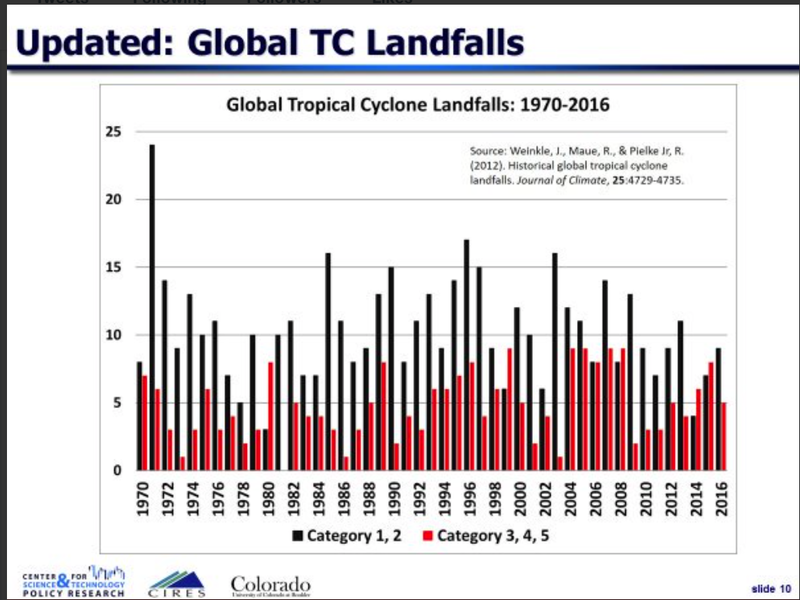 To paraphrase what Instapundit Glenn Harlan Reynolds has said about Gore and others of his ilk: I’ll believe global climate change is a crisis when Gore and his ilk start acting like it’s a crisis.